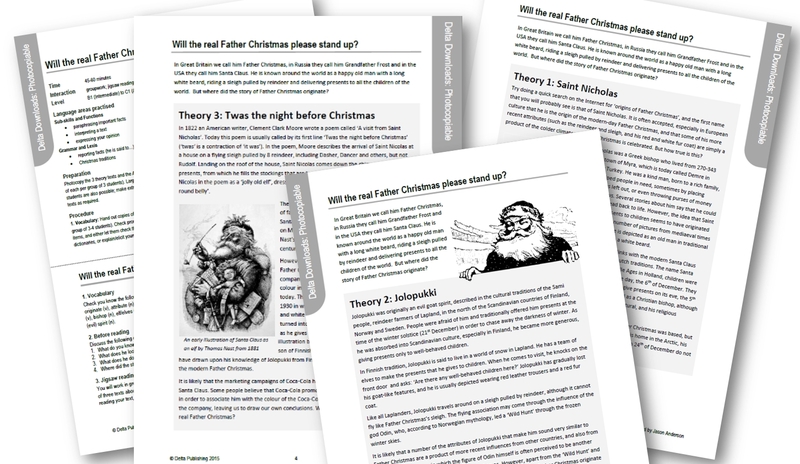 In case you are looking for a Christmas English lesson, follow this link to Delta Downloads, where my latest photocopiable activity is a jigsaw reading that explores the origins of the Father Christmas character. Students are involved not just in reading and regurgitating the texts, but they also have to interpret the data and share opinions. It’s great fun! Click on the image above for a sneak preview! In case you were wondering, Father Christmas, as we know him today, isn’t simply Saint Nicholas, but a complex combination of a range of influences from Europe, Asia and North America, both religious and pagan. If you’d like to know why the Finnish goat-spirit, Jolopukki is so important, and what links him to a major American brand, or why Santa Claus always wears red and hangs around with reindeer, just go to the Delta Downloads website. If you’re not a member it takes just a few details to sign up – all free!